When I go on safari, I tend to take a fair amount of equipment with me, this will include most importantly a good pair of safari binoculars, a camera with a telephoto lens and more recently some sort of night vision device. This is because after the sun sets, so much of the African bush comes alive and what we see during the day is only a very small percentage of what actually goes on. For example most of Africa's great predators hunt at night and spend most of the day hiding in the shade. The traditional way to view wildlife at night is to use a spotlight, as is was for security and military surveillance. The problem with this technique is that you startle whatever you are looking and it stops acting in a natural way. In some cases as with owls for example, a spotlight shined in the eyes actually temporarily blinds the bird, it flies off because it is startled and crashes into branch, possibly breaking a wing, dooming it to a terrible and certain death. 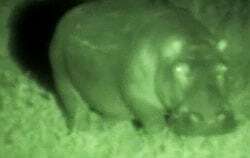 Thankfully there is now a much better way to view wildlife and pretty much anything else at night - a night vision device. In the past because of their very high prices, quality night vision binoculars and other devices like monoculars and goggles were well out of the reach of the average person and because of this most were reserved for use by the military, police and professional security services. But as night vision technology improved and the amount of manufacturers producing them increased, the prices for good quality devices started to come down and now it is possible to get your own really good quality pair of night vision binoculars without having to take out a second mortgage on your house. As I write this, I will be going on Safari in Zimbabwe in a few weeks time and thanks to Opticalia Ltd, the UK distributors of Luna Optics, I am lucky enough to get the chance to review these 3x magnification Luna Optics LN-PB3 night vision binoculars and if I like them enough, I'll be taking them on safari with me. Update: I have since returned from my safari trip to Zimbabwe and as such, I thought it would be usefull to add my findings to this review - all these updates will all be highlighted in orange text. Whatever available light there is (ambient light from stars, the moon and man made lights etc) reflects from the viewed object, passes through the objective lens of the LN-PB3 night vision binoculars and creates an image of that object on a photo cathode screen, which is located on the front of an Electronic Intensifier Tube inside them. Inside this Electronic Intensifier Tube, the light is electronically amplified and projected in a green glow on a phosphorescent screen, located on the back of the tube. Then the illuminated image is picked up by the Ocular and then transmitted to your eyes. If there is not enough ambient light to see clearly or in complete darkness you can use the built-in Infrared illuminator that emits Infrared light onto the object that you want to view, this then reflects back and is amplified by the tube the same way as ambient light. For more information, take a look at my section on night vision devices. The first thing that you notice when taking the LN-PB3 out of it's case is the very aggressive styling. Unlike most standard daytime binoculars that are covered in rubber these days, Luna Optics have left the body exposed, which adds to the tough, masculine look to them - they really do look the business! Constructed from an all aluminum body they are not only lighter than they look, but as Wired Magazine puts it, they feel sturdier than a Soviet tank! Their actual weight is 760g (1.68 lbs/26.8oz) which puts them at about the same weight as most full sized binoculars. Their dimensions of 165mm x 115mm x 56mm (6.5"x4.5"x2.2") also means that apart from their length they are pretty much the same size as most roof prism 42mm binoculars. On top of the body and easily reachable whilst holding the binoculars up to your eyes is the On/Off and Infrared illuminator (IR) buttons. There is also a plate that slides off (accessory slot) that enables you to mount an optional LN-ELIR-1 laser IR illuminator. This is a powerful illuminator extends the already impressive range to an incredible 800m, which is almost unheard of for a Generation-1 device. Next to the left eyepiece is the battery compartment that takes 2xLR1 type (N-size) batteries that Luna Optics say gives them an operating time of 30 hours. It is accessed with a twist off cap, that because it is spring loaded, can be a little tricky to replace. Protruding out of the front of the body and in between the two barrels is the built-in IR illuminator (Infrared illuminator) that enables you to use the binoculars whenever there is not enough ambient light to see clearly even even in complete darkness. It does this by emitting infrared light, which reflects from the viewed object and is then amplified by the tube in the same way as ambient light is. Next to it is the light sensor that protects the binoculars from exposing the sensitive internal components to any bright light. A point to mention is that these Luna night vision binoculars weather resistant and are not fully water or fogproof - something that you may consider if you need a device full wet weather night surveillance. Often overlooked and their importance underestimated are the eye-cups, but remember that this is the point at which your instrument meets your face and so can make the difference between a really good and a bad pair of optics. Overall the eye-cups on these Luna N-PB3's are great, they are made from a rubber that feels rather plastic compared to most others that I have tried. At first I was a little put off by this, but bring them up to and press them firmly to your face and they are very comfortable. I also really like the "wings" on the sides of them that ensures no external light can enter from the side of your face and disrupt your view. Each barrel on these night vision binoculars is focussed individually, by twisting the ends of them. So even though it only takes half a turn to go from it's near focus to infinity, because you have to do this for each lens, compared to a conventional central focusing binocular for example, this process is a little slow. Each eyepiece (ocular lens) can also be adjusted separately using the ring just under the eyecup and it plays an important part in setting up these night vision binoculars to suit your eyes. The easiest way I found of doing this was to close one eye, adjust the setting on the eyepiece for the open eye until what I was looking at was in focus and then do the same for the opposite eye. In general, the larger the objective lens, the more light gathering potential of your optics. Therefore giant objective lenses may seem ideal, but that would increase the size of the binoculars and large lenses are also far more expensive to make. I think with 50mm objective lenses, these Luna night vision binoculars have got the equation about right with more light gathering potential than most full sized binoculars (usually 42 or 43mm), yet they are still compact enough to easily carry around with you. All that I could find out is that these Luna LN-PB3 night vision binoculars use high-quality all-glass optics with multicoated lenses as well as multi-lens elements to provide what Luna Optics say is the "best possible image under any light conditions." If I break it down, multicoated lenses mean that at least some air to glass surfaces (usually the first and the last) have multiple layers of antireflection coatings that help to transmit as much light as possible. I presume that the reason that they highlight the fact that these use "all-glass optics", they are saying that there are some devices on the market that use other materials other than glass, but am not sure? Many people who are used to using standard daytime binoculars may wonder why you can't find night vision binoculars with 8x or even 10x magnifications and if a 3x magnification is powerful enough for them. The reason the magnification on night vision devices is usually much lower than of the daylight binoculars or spotting scopes is because to make higher magnifications, the objective lens elements need to be thicker. This means that they will transmit less light than thinner lenses. As every little bit of light transmitted is so important during the night, to make night vision viable, the magnifications have to be lower, usually under 7x, thus preserving the best possible balance between image magnification and the light transmission. The LN-PB3 uses top grade, hi-resolution Generation 1 night vision technology, with intensifier tubes that amplify the ambient light up to about 900 times. (more information on Night Vision Generations) These are the most used tubes among general consumer devices, mainly due to their relative low cost. Rather confusingly though, even within Generation-I, tubes you can find quite a large difference in performance. This is because during the manufacturing process all tubes are evaluated and graded according to their quality and performance and are sold at significantly different prices depending on their light amplification and image clarity. This of course is reflected in the final price of the Night Vision device. Luna Optics are proud of the fact that they only buy the top grades of the intensifier tubes, and so even though some of their models may be a little more expensive than other Gen1 devices of their competitors, you can be sure that you are getting the best quality possible. Additionally, as a part of their quality control, every Luna Optics device is inspected twice: once at the factory level and once again at their US warehouse prior to shipment. So what does this all mean in real terms, well switching them on and looking through them for the fist time, the back of my garden which is 120ft away was easily visible. The quality of the image was pretty good and there were far less black dots that what I have seen in other night vision devices. I live in an area that does not have many street lights and there was almost no moonlight and a fairly overcast sky, I was really impressed by the brightness of the image as well as the contrast. If there had been a lion back there, I would have been able to see every bit of detail! The second time I used them was before sun rise at about 4am (hey.. I have a daughter who is just 2 months old! ), at this time there was far less light from peoples houses and once again image brightness was what I would describe as excellent for a Gen 1 device. Turing on the built in IR illuminator for the first time is also a real treat as the already fairly bright image now almost jumps back at you. If you have never looked through a night vision device before, prepare to be amazed as you really can see in complete darkness! With so many hippos, this sight is not uncommon around Lake Kariba and I have often seen them eating at night, but never without a light. So I quickly reached for the Luna Optics binoculars and what I saw was a complete revelation. Sure enough there was a large hippo munching on the grass only 20 meters from the boat, but what I also saw astonished me. I could clearly also see a bat flying around it again and again. This made me think what was going on and all I could do was come to the conclusion that it must have been an Insect-eating bat (Microchiroptera) that was taking advantage of the fact that the hippo was flushing insects out from the ground. For me this was incredible and I just wonder if anyone has ever seen this behavior or even if it has been documented it before? Whist the video below was not taken through the Luna Optics LN-PB3, I think that it fairly accurately reflects the view that you can expect to get when looking through them and is similar to the quality and brightness that I experienced during my test without the IR illuminator switched on. 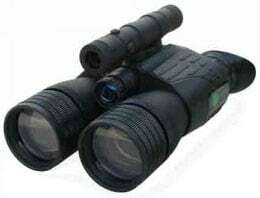 These night vision binoculars have a really long viewing distance of 300 meters (978ft) which is excellent. For comparison the ATN 5x90 Night Scout Night Vision Binoculars have what they call a detection range of 150 meters. The 3x50mm combination for me is a great compromise between the size of the binoculars, light gathering potential and the brightness of the image. Remember to increase the magnification, you need to have thicker glass, this means that less light gets transmitted to the photo cathode screen, meaning that the image will be less bright. The field of view for the Luna Optics PB3 is an excellent 364m at 1000m / 1092ft @ 1000 yards (20°) which when you have been used to looking through standard binoculars is massive. 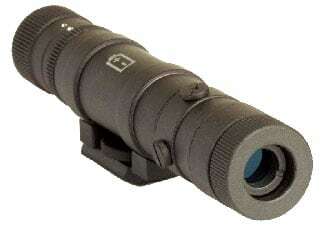 It also compares very well with other night vision binoculars on the market. 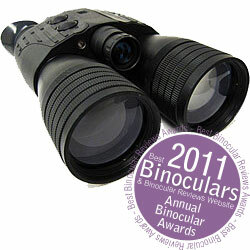 The minimum close focusing distance of only 2m (6.5ft) is also excellent for a night vision binocular. These night binoculars come with a large soft carry case that has plenty of room left over to store other things like a wallet or keys for example. They also come with a thin nylon neck strap that is a little disappointing with it's lack of padding. The plastic lens caps fit well to the end of the objective lenses and will not fall off accidentally. They have small pin holes in them so you can look through the binoculars during the day. The LN-PB3 binoculars have a built-in accessory slot on top of them where you can mount a Luna Optics LN-ELIR-1 laser illuminator. This is a much more powerful illuminator than the built in one that is capable of resolving targets at an incredible distance of 800m. It has 9 power settings that are adjusted by turning the dial at the end of the device and a fully adjustable beam (width and position along the axis), so that it lines up exactly with the view that you are looking at through the binoculars. I tested it during my review and I was completely blown away, the built in IR illuminator is impressive, but the LN-ELIR-1 takes the view through these binoculars to a whole new level. It has the effect of casting a circular light beam in the center of your view, almost as if someone has pointed a powerful spotlight in that direction - absolutely incredible and I would highly recommend getting one as it really makes a huge difference. Update: After my trip to Zimbabwe, where I used these night vision binoculars a whole lot more, I would like to stress that if you are going to get them that, you should also really consider get the LN-ELIR-1. An example of how the LN-ELIR-1 really helped me was on a night where I was woken by noise in a tree behind the lodge we were staying at. It was a sound that I had never heard before, very loud, a little like a human child crying and rather scary! I decided to go and investigate. Using just the binoculars, I could make out that there was something fairly large in the tree, about the size of the cat, but because it was fairly high up, I could not fully identify it. 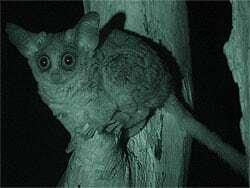 Turning on the LN-ELIR-1 laser illuminator to full power, I was able to immediately recognise it as the Greater Bush Baby (Galago crassicaudatus). I was thrilled to have seen it and to have been able to put this rather eerie noise to a face - after watching "him" for a while, he moved out of sight and I went back to bed - It was really fantastic to have seen it init's own enviroment and acting normally without me disturbing it with a light. What is also worth pointing out is that because you are using an illuminator to light up an area, even though it is invisible to wildlife, their eyes shine back at you, almost like cat eyes do on the road. This makes finding animals in the bush soo much easier than when you are not using the illuminator. I was very impressed with the LN-PB3 night binoculars, I especially like the ruggedness and look of them. It works really well, the image produced is bright and the contrast is a real highlight. Sure you can get brighter night vision devices, but in my experience only on higher generation devices that cost many, many times more than these. Another highlight is the very close focusing distance and the wide field of view, which will help with quickly locating your subject. I also didn't get any of the high pitched whine that you sometimes get on cheaper night vision equipment - this is important if you will be observing easily spooked wildlife. Update: To say that I loved these night vision binoculars is an understatement - I have used other night vision devices on safari before, but none have even come close to these Luna Optics LN-PB3 binoculars. They were truly excellent and provided me with many memories and talking points that I would not have even known about had I not had them with me. I also feel that it is worth repeating - if you do get a pair that you also get the optional LN-ELIR-1 laser illuminator as they really take the view through them to a completely new level. Weak points? I guess would be the time it can take to focus the binoculars as you have to adjust each lens separately. For the most part if you are looking at objects in the distance, you should not have to do this too often as the focus would be just set to infinity. But if you are constantly changing from looking at something near to you and then to something in the distance, having to adjust each lens could get a little annoying. 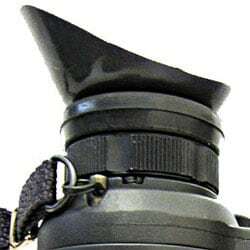 Being very critical, I would also liked to have had a padded neck strap, to make them more comfortable although I do like the little split rings that attach it to the binoculars. 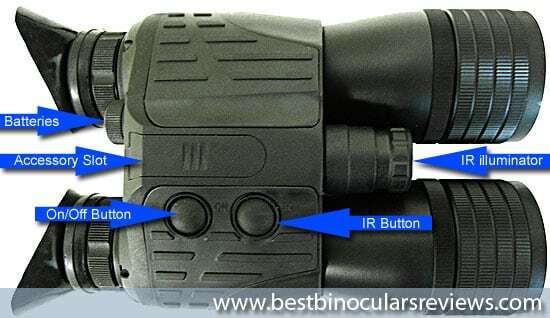 Overall if you are looking for a good quality relatively in-expensive 1st Generation night vision binocular that is ideal for home security, camping and night time wildlife observation, then these are ideal. I just can't wait to get them out there with me on safari! (On my return in a few months I will add my findings to this page). I would like to thank Opticalia Ltd, the UK distributors of Luna Optics, for providing me with the sample to review. I would also like to point out that all the reviews on this site, including this one, are my opinion and are not influenced in any way by manufacturers, distributors or suppliers.